This is a reference to a grid definition, which provides the information needed to georeference rasters and vectors to a common coordinate system. ENVIGridDefinition is only a definition, not a spatial reference or raster. It can be used as an input to ENVISpatialGridRaster or to define the grid parameters for an empty raster. It does not refer to any raster or rely on any specific raster to set its extents. 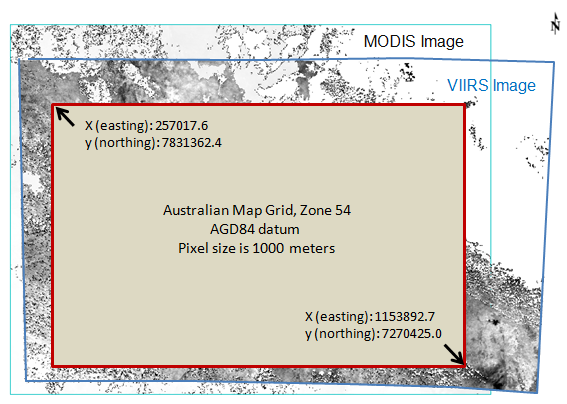 This example defines a new spatial grid that is based on an Australian Map Grid Zone 54 coordinate system. Two images with different coordinate systems will reproject to this grid. The images are available on the ENVI Resource DVD (in the APIGriddingExamples folder) or from the ENVI Tutorials web page. Click the "ENVI Tutorial Data" hyperlink. Copy the images to your local drive. This routine returns a reference to a grid definition object. Specify an ENVICoordSys object that defines the coordinate system to use for the grid definition. You can use the coordinate system of an open ENVIRaster or ENVIVector using its COORD_SYS property. On Windows sytems, these files are best viewed in the WordPad application. Use the Ctrl+F key combination to help find projection names. The ENVICoordSys object that defines the coordinate system used for the grid definition. where x and y are map coordinates (x=eastings, y=northings) or geographic coordinates (x=longitude, y=latitude), depending on the ENVICoordSys object. The coordinates must be in the same units (degrees, meters, feet, etc.) as the associated ENVICoordSys object. If you set this property, you must also specify (1) PIXEL_SIZE or (2) NROWS and NCOLUMNS. Specify the number of columns in the grid. Specify the number of rows in the grid. Specify a two-element array with the [x,y] pixel size in the same units as the associated ENVICoordSys object. The coordinates must be in the same units (degrees, meters, feet, etc.) as the associated ENVICoordSys object. If you set this property, you must also specify NROWS, NCOLUMNS, and PIXEL_SIZE. Specify a two-element array with the pixel coordinates of the tie point. If you set this property, you must also specify TIE_POINT_MAP, NROWS, NCOLUMNS, and PIXEL_SIZE. If you do not set this property, the default pixel coordinates are [0,0].